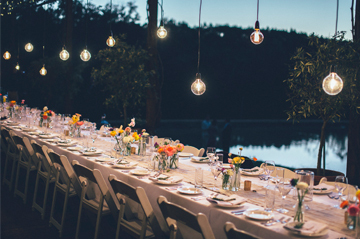 Stonebarn is a "sole-use" venue which means we rent out the entire lodge at a time. You have the exclusive use of the 80h/160 acre estate, surrounded by state forest, an antique bath in the forest with unlimited hot water, kilometres of river frontage and marked hiking walks around the property. The maximum amount of guests at Stonebarn is 100 due to limited parking. We are therefore able to offer the choice of six ceremony locations, three reception areas, and many photography locations. Best of all, as an exclusive venue you will not be sharing your wedding with anyone else and so there is no curfew. You can end your wedding at a time that suits you, or celebrate all night! 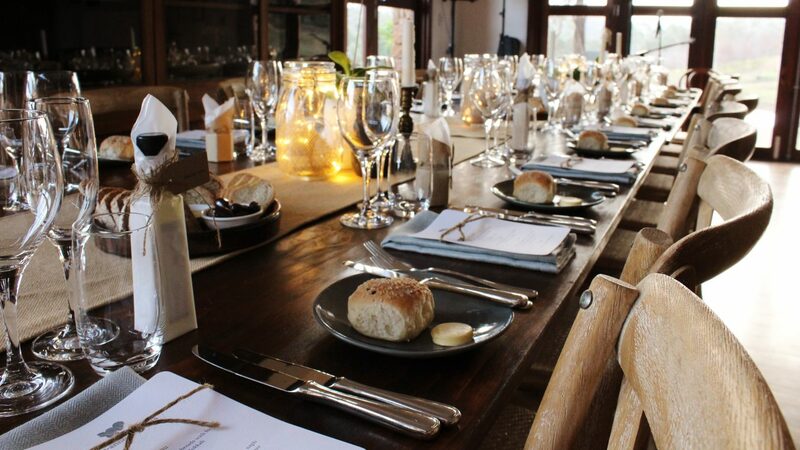 Stonebarn is a self-catered and BYO alcohol (with no corkage fee) venue, so you're most welcome to bring your own food or chef or catering company to the lodge to prepare the food (there is a fully equipped chef's kitchen, wood fired oven, BBQ and plenty of refrigeration space for your own alcohol). Please find attached some information about the different catering companies we work with, if you’re interested I can also send you 3 different catering & alcohol packages we can offer. The accommodation at Stonebarn sleeps 16, comprising 6 luxury suites upstairs and 2 double ensuite bedrooms downstairs. We can also let out our self catering apartment (also on site) for weddings - this can sleep up to 4 in two queen bedrooms. In the lodge each upstairs suite is 50 square metres with en-suite bathrooms, clawfoot baths, glass showers and sunken french double basins with separate toilets. Rooms feature four-poster, king-size beds and small balconies overlooking the lake and the truffìèrie. For your other guests attending the wedding, there are many bed & breakfasts/small cottages in the area, please find attached a separate document listing nearby accommodation other weddings have used. We are able to cater for up to 100 guests at the actual ceremony and reception (120 is possible if guests are coming by bus or taxi as our parking is limited to 100). You will be met and shown around or a key will be left in a safe place for you, then left to your own devices to enjoy the lodge and surrounds. The lodge is fully equipped with everything you will need for your stay so all you need to bring along are clothes and food. You have the use of the restaurant quality kitchen along with a wood-fired oven and BBQ facilities outside. The dining room has a 12 seater table as well as a number of 4 seater tables that can be arranged as you like. We also have a large, sheltered outdoor area and a long verandah that overlooks the dam and forest if you'd like to have a long table dinner/lunch or a larger cocktail function undercover. You will see from the attached documents that we have trestle tables and chairs onsite we can hire for the reception and also for the ceremony we have an arbour, 10 benches and 5 church pews you can use free of charge. If you would like to use alternative furniture and would like some help styling your wedding we can recommend some stylists/hire companies if you don't have someone in mind. Pricing for weekend wedding hire for the entire lodge is $9,800 for 2 nights (minimum stay), $11,700 for 3 nights or $13,200 for 5 nights + a $1,000 returnable bond. We also offer a 2 night mid-week special for $6,000. As Stonebarn is a sole use venue, the entire estate will be exclusively yours for your stay. We don’t charge a separate venue hire, so you can enjoy the flexibility of using all or any of the areas below for your ceremony and reception, or a combination of a few to suit your requirements. 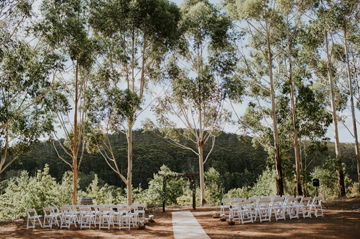 The Clearing - Hidden amongst giant karri trees with breathtaking views of the forest and truffiére, a special place to exchange vows. Verandah - Overlooking the dam and forest, shaded by grape vines with views to the truffiere, the Stonebarn verandah is perfect for long table dinners, ceremonies & cocktail celebrations. Gazebo - The Gazebo’s outdoor charm offers the perfect blank canvas to create your ideal wedding celebration. Nestled high above the dam, the gazebo has views of the native forest, truffiére and water and has clear cafe blinds for wet weather. Dining Room - The spacious dining room overlooks the garden and the forest with large windows, wooden floors and high ceilings and a buffet serving area for food, beverages or an MC. River - The serene Warren River runs through the estate and is a secluded location in natural beauty to exchange vows overlooking the gentle water, native trees and mossy banks. 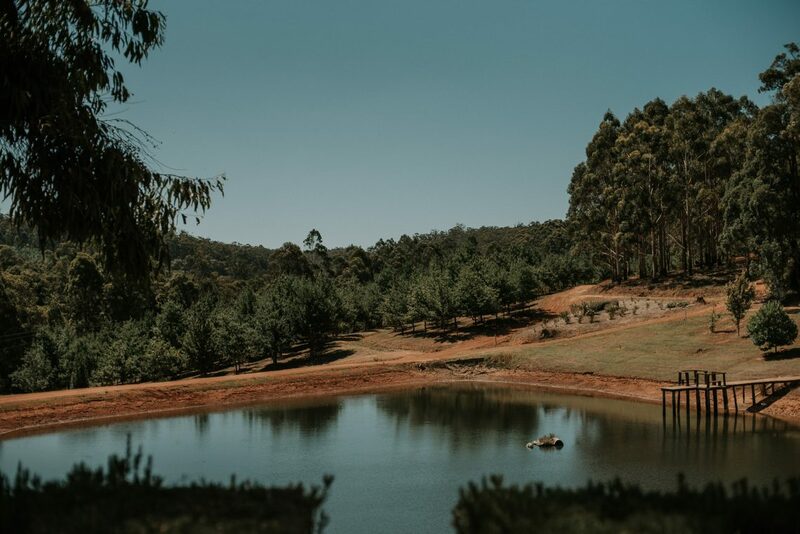 Dam - A gentle sloping bank runs from the verandah to the dam, ideal for a ceremony with a view that’s close to the lodge – the dam’s jetty overlooks the water and the truffiére. 12 reasons to get married at Stonebarn. Exclusive use of the entire estate. Exclusive use of the 160 acre estate, surrounded by native forest, an antique bath amongst the trees with unlimited hot water, kilometres of river frontage and marked walks around the property. Six ceremony locations. 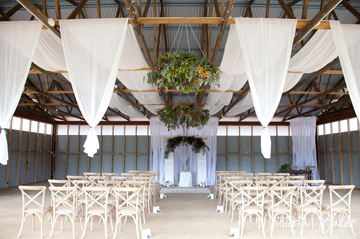 Say your I dos at the Gazebo, the Clearing, the Verandah, the Dining Room, the River or the Dam, (for no extra cost). Three reception areas. Celebrate with family and friends on the Verandah, in the Gazebo and in the Dining Room, (for no extra cost). Many photography locations. 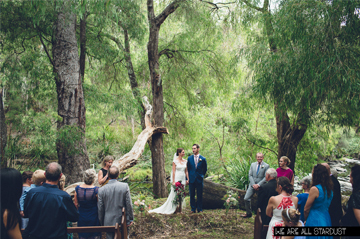 Capture your wedding day around the local stone architecture of the lodge, over the dam, by the old bridge, in the ancient karri forest, and by the Warren river. Luxury accommodation included. Sleep in six luxury suites (+2 bonus bedrooms, with en suites), and use the wedding suite to get ready for your big day. There’s plenty of nearby accommodation to suit a range of budgets for guests. BYO alcohol. Your choice of drinks, no corkage, no markups (and no surprise bills the next morning from your uncle that likes single malt whiskey). Blank canvas. Create your own wedding exactly the way you’d like it. If you’d like help, we can introduce you to a strong network of highly professional, trusted local suppliers to help you make it happen. No surprises, no hidden costs. All costs are included in our packages, and hire items are quoted and ordered in advance. No surprise costs or hidden fees. Hunt for truffles. In the Winter months, join a truffle hunt at the Manjimup Stonebarn Truffiére and enjoy fresh truffle with your wedding meal. Celebrate all night. As Stonebarn is exclusively yours for the duration of your stay, there is no curfew. End your wedding at a time that suits you, or celebrate all night! Destination wedding. Get married in the heart of the forest and truffle country. Visit local Manjimup and Pemberton galleries, cafes and wineries, and enjoy walks along a network of forest tracks. Take a tour and paddle a canoe on the river, visit the Yeagarup Dunes, see the native wildflowers in Spring and visit one of the tallest climbing trees in the world. Honeymoon. Stay a few more days and enjoy the tranquil natural surroundings, forest trails and secluded bush bath. Stonebarn is a unique hideaway to relax, retreat and make memories.